For once, I have a reasonable excuse for not blogging for weeks. The majority of my free-time has been spent taking care a new addition to the family – a baby rabbit. The furry bundle of joy, who Claire and I have named Roman, will live with us in our house, and will not be placed outside or in a garden shed. In short, he will live the life of Reilley. The decision to take on a house rabbit was one which we had given much thought. After buying our own home last year, the restriction on keeping pets, imposed by landlords, was irrelevant. We did consider a dog but decided against the idea. With the two of us working fulltime and the likelihood that there was absolutely no frickin’ way of us taking our four-legged friend for a walk on a daily basis, it would have been cruel and irresponsible. We are both not fans of cats, so felines were ruled out from the start. The next choice was therefore a rabbit. I have grown up, keeping rabbits as pets, and found them to be friendly, rewarding and intelligent animals. Indeed, I would rank their intelligence closer to that of a dog or cat, compared to that of a hamster or guinea pig. This may sound strange to some, but most rabbit owners will agree. 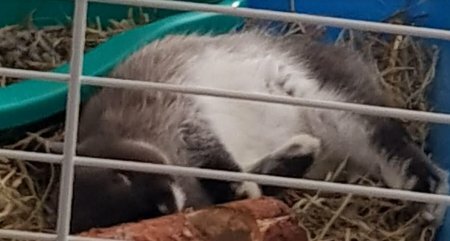 Anyway, back to our rabbit. Roman was purchased from Pets at Home on Wednesday 12th April. 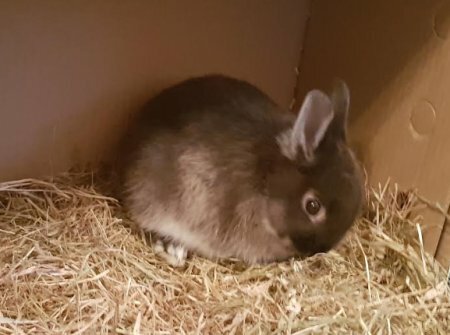 He is a Netherland Dwarf – a breed I was particularly keen to keep. It was always our intention to keep a house rabbit, as opposed to sticking one in a wooden hutch outside. 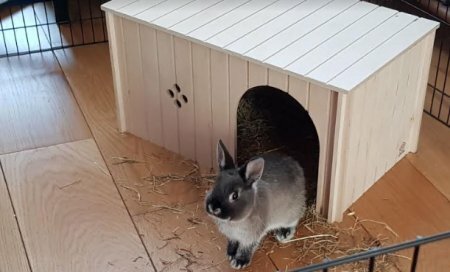 Therefore, for the rabbit’s wellbeing and to preserve space in our own home, we didn’t want to buy a cross-breed, which could potentially grow very large and need a massive cage – plus Dwarfs look super cute. • I say “somebody”- his friendliness currently only extends to Claire and me. The two of us feed him at least twice a day and have frequent chats with our furry pal. He loves being stroked while eating, or having his tummy and feet rubbed when he approaches the bars. Out in the play pen. Roman is very unsure if he likes it! • Ah yes, the food pellets. These must surely contain some Class A drug, as Roman goes crazy for them – and I mean CRAZY. He will bolt up and down the cage, or skip in the air, if he senses he is about to be fed his favourite food. He is always given a fresh supply of hay and we have recently introduced fruit and vegetables to his diet; but it is clear that these moreish pellets are his number one. • Roman loves to chat. He doesn’t speak back – which is unsurprising, although I would love him to – unless he sounded like James Corden, from Peter Rabbit. On many occasion I will be talking away to him, and he will jump for joy or perform a binky for me. A binky is a rabbit’s way of displaying upmost happiness. It is when they jump into the air and spin repeatedly. I’ve seen Roman perform two full 360 degree turns for me in one binky. He somehow knows that it is him we are talking to, as opposed to Claire and me just talking together. There is so much more l could write about the furry cherub, and I will try my very best to do so in the future. Since my last blog, I have acquired a new set of wheels. However, these are not the traditional set of wheels you would expect me to buy, for it is not a car. A few weeks ago, I purchased a brand new, shiny mobility scooter. For those of you who do not know me, or haven’t seen me for years, I suffer from a condition called scoliosis. This has caused my back to curve, for me to shrink in height and have severe walking difficulties. Indeed, I would not be able to walk without a crutch. Even with such a walking aid, I find getting about very difficult and painful. Then one day it came to me. I was asked why I should have to put up with pain and struggle, while doing something as simple was walking. Since developing scoliosis, I have always tried to retain independence and dignity, so ruled out wheelchairs and such like. However, the option of not having to push myself through the pain barrier, on a daily basis, was one I now consider crucial. Since becoming a scooter-user, I feel a lot less stressed, both mentally and physically. My fears of losing independence and dignity have proved untrue. In fact, I have gained greater independence, as I now have the option to visit places I would have struggled to a few months ago. I even feel more dignified. The sight of a man in a mobility scooter, riding along the pavement and office, looks far less strange than that of somebody with a crutch, dragging their body, clearly in pain, down the street. Living round the corner from work, I can easily “ride” from my house. 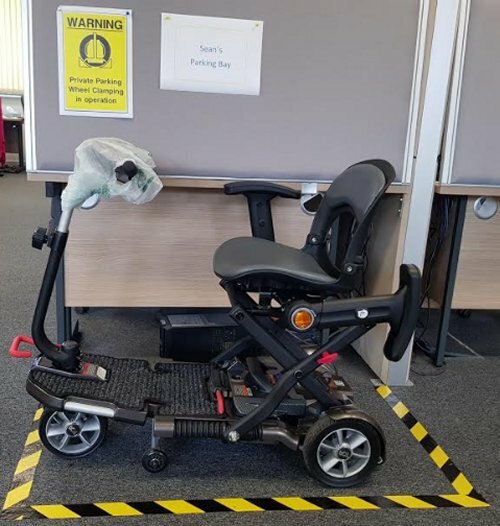 While many car drivers struggle to find somewhere to park their vehicles, I have a designated space, just feet away from my desk. Pretty cool, huh?